Yes, I can make an Excel pie chart. Get at me. 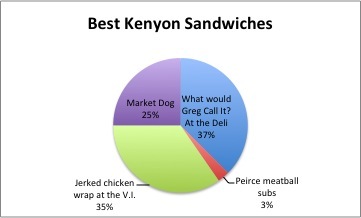 Yes, 25% of you voted that the Market Dog was the best Kenyon sandwich. A fair choice indeed. How do you explain this, then? Hypocrisy, people! « Do it tonight: The Mighty Mighty Stairwells! Hilarious, but I don’t think that’s how percentages work. 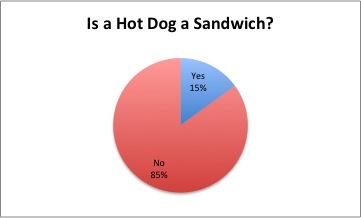 Unless you only asked the Hot Dog lovers whether Hot Dogs are sandwiches.